Background: About 4 years ago, friends Holly and George decided to open a cafe. Both hailing from creative careers - Holly in arts education, George in prop and set design - the cafe was always going to be stylish, individual, and with a lot of handmade elements. After a blindingly successful Kickstarter campaign and almost a year of searching for the perfect location, The Pigeon Hole opened in June 2014. It's since become a local favourite, serving a range of locally produced food and drink - think Volcano Coffee from West Norwood, pastries from Christopher's in Herne Hill, and sumptuous cakes from Smash Bang Dollop in Crystal Palace - as well as hosting film nights, jewellery workshops, life drawing classes, and guest chef supper clubs. The cafe also supports local artists and makers with a rotating exhibition on the walls and hand crafted products to buy. 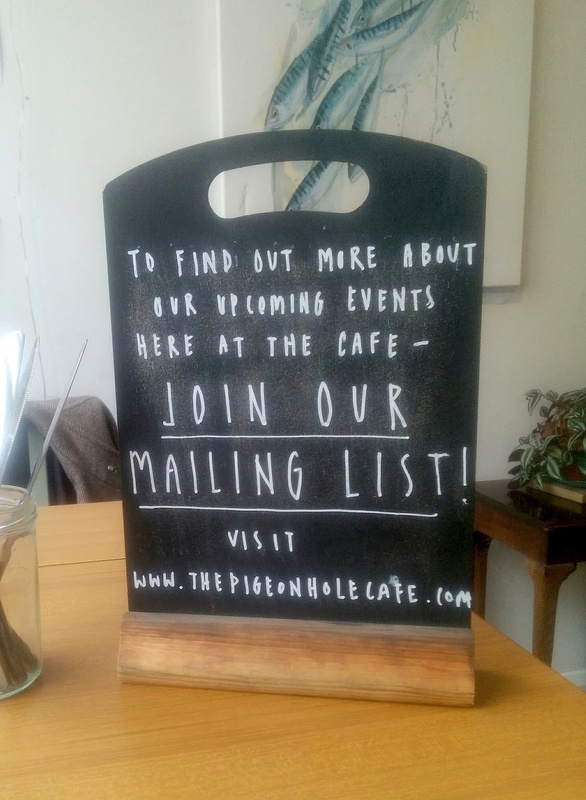 With the newly pedestrianised area outside the cafe, The Pigeon Hole will be the place to relax this summer. You can find The Pigeon Hole online, on Instagram, and on Twitter. Visit the cafe at 2 Datchelor Place, Camberwell SE5 7AP.